Buy SWAG's 2001 CD, Catch-all from Amazon.com and Amazon.co.uk. Also available to download from Amazon or iTunes. Extra Information about SWAG and The Mavericks - 17 pages in all to keep you busy! 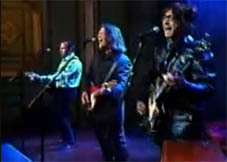 SWAG on the Conan O'Brien show, 2001. Robert Reynolds, Doug Powell and Warren Pash. Watch SWAG play "I'll Get By"
Listen to unreleased tracks on Robert's Digital Rodeo page. Buy Robert's art and music - check out his Instagram page. And his Facebook page too! Plenty of extra information on here for you about Robert's collaborations, etc. 17 pages of Information about The Mavericks and SWAG. Lots to read! Buy Scotty Huff's "Assorted" from Amazon.com or Amazon.co.uk - available also as an Amazon mp3 download. Robert Reynolds and Paul Deakin joined with Matt King but this project didn't really go anywhere. Our News archive has an item dated June 10, 2006 about it. Jon Roniger - Robert Reynolds co-produced one of his albums. Anything missing? Let me know.